Awaking at the petrol station we were pleased that our nights sleep had been undisturbed – we were obviously sufficiently out of sight! Not wanting to outstay our welcome on the forecourt, we packed up and set off. Our aim was to find Dominic and Mario. 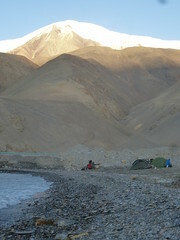 They hadn’t agreed with out choice of camping area, so had carried on and set up a bit further along the road. Breakfast consisted of their Nutella (must be a Swiss thing for previous companion Baptise was also a heavy user of the stuff! 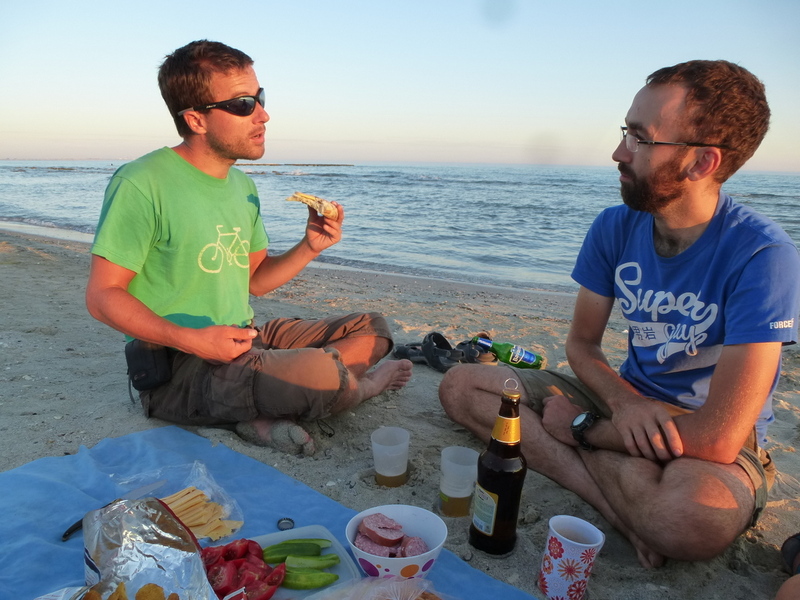 ), bread and some fruit. Of course, we also got out our stove and kettle to treated them to a proper English brew. Dominic had to drink from a bowl because he’d sent his mug home in an effort to save weight!!! 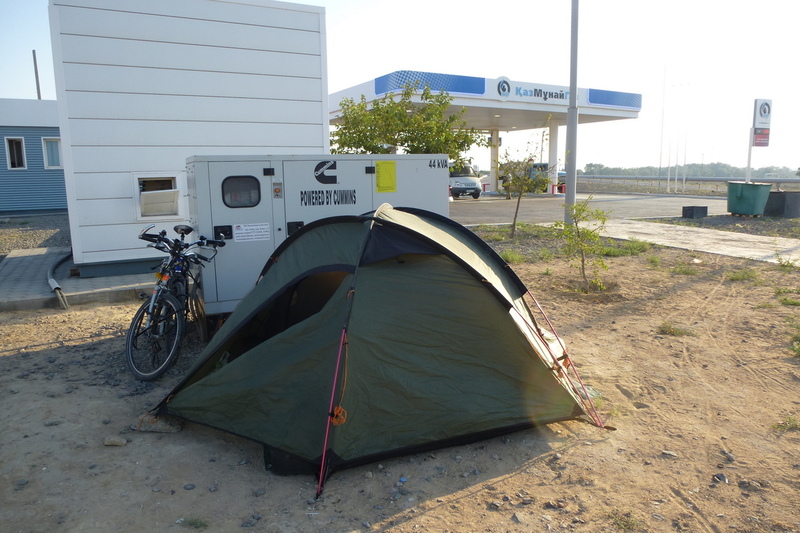 Camping at the Petrol Station – Making a breakfast brew for the Swiss. Breakfast over, we packed up, headed into town and bumped into Paul. He had left Baku days ahead of us. 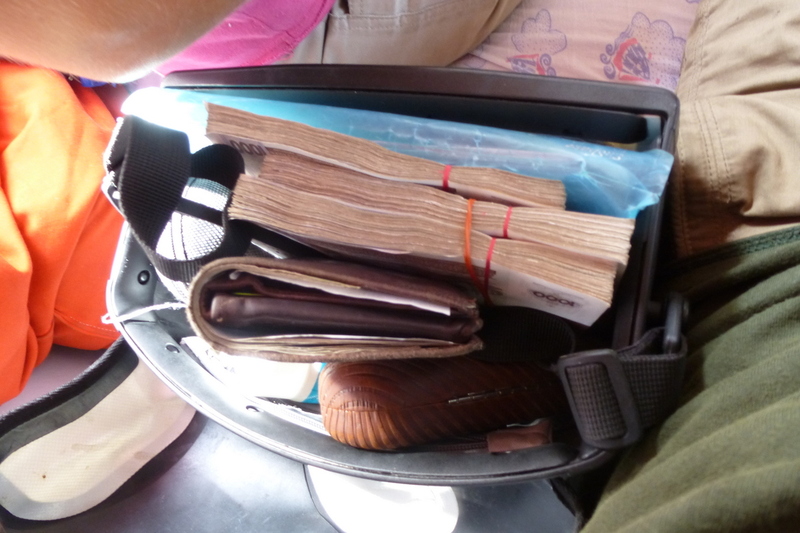 It turned out that he’d been riding in the desert for two days when multiple major drivetrain failures occurred on his bike – he’d returned to Aktau in a taxi to work on ‘Plan B’ (order spares and leave the country by train). 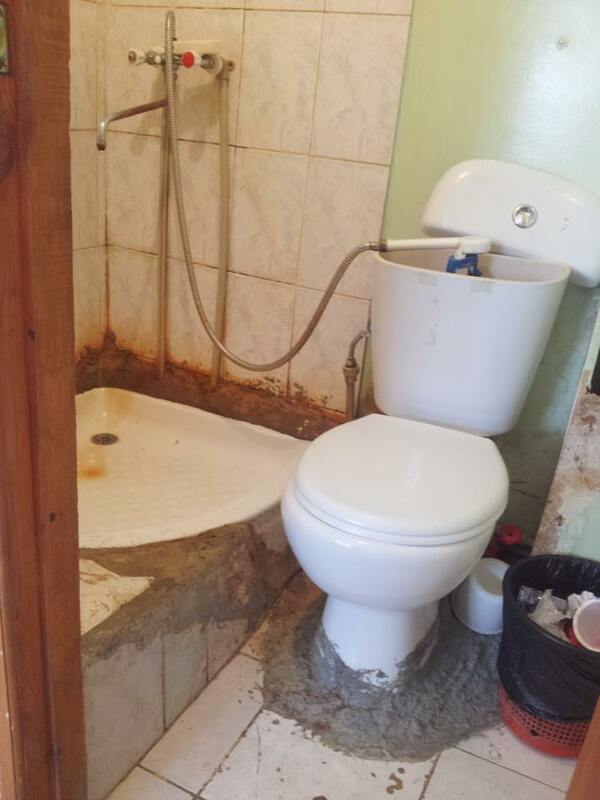 On Paul’s recommendation we headed to the ‘cheapest hotel in town’, he warned that it wasn’t pretty but it was cheap: he wasn’t wrong!! 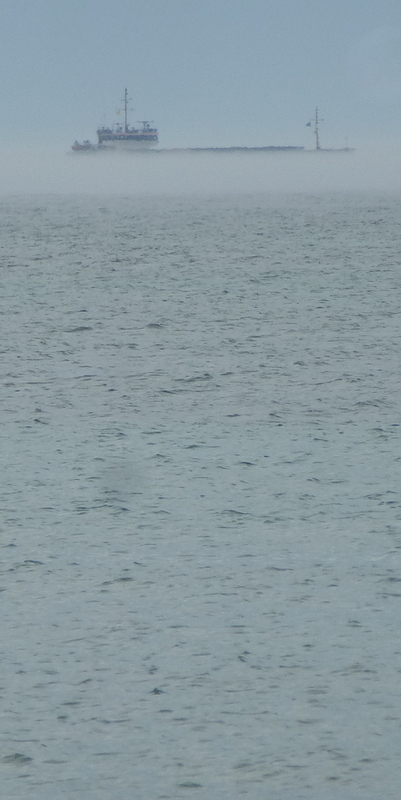 Sea Mist on the Caspian – Worst hotel bathroom yet! It was so hot that a trip to the beach was definitely in order. Tim elected to hold the towels and this turned out to be an inspired decision for the water was colder than the English Coast! The swim did not last for long, if at all!! Rebecca only just got in the water, Paul manned up and dived straight in! Later, in the Cyber-Cafe, we met more old friends from Baku – German Frank and French Stephan – who had crossed on a later ferry and caught us up. 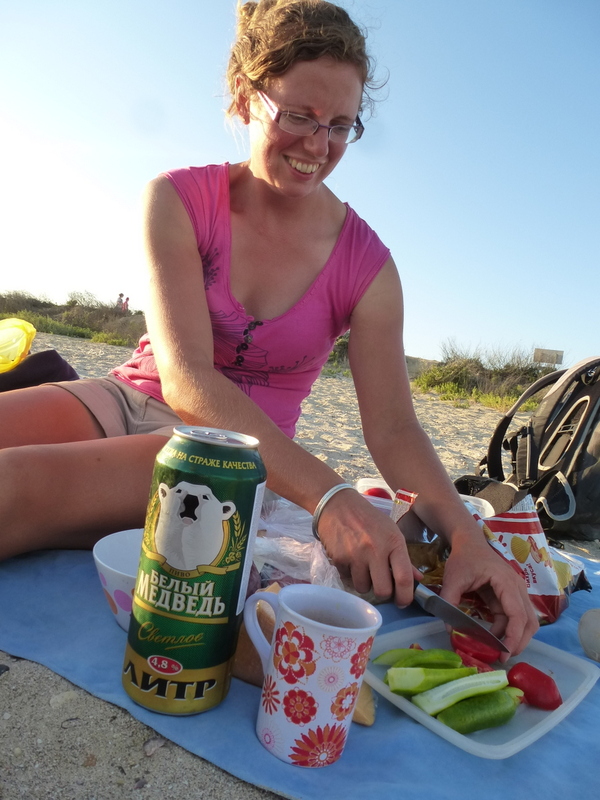 Picnic on the beach with a litre can of ‘Polar Bear’ Beer! 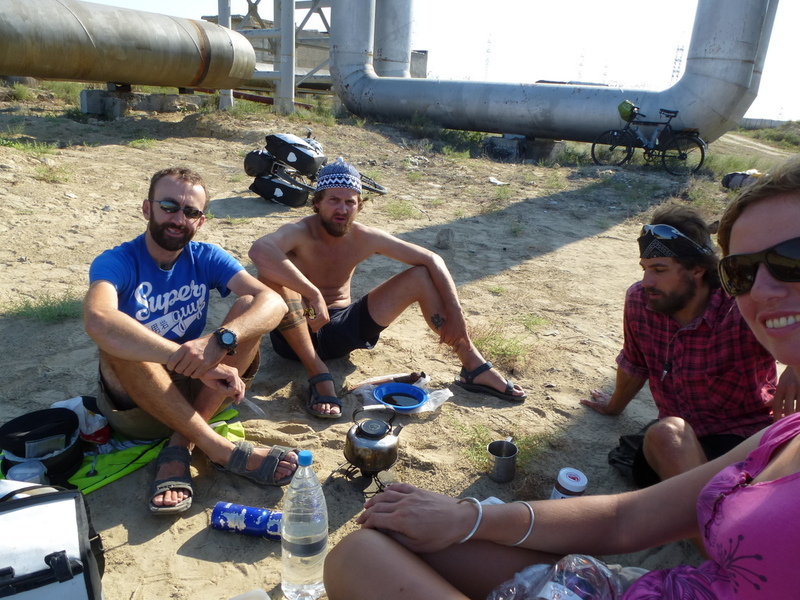 We did not fancy crossing the dessert by bike so opted for a 24hour train adventure that would take us from the Caspian coast in Kazakhstan to the west of Uzbekistan. 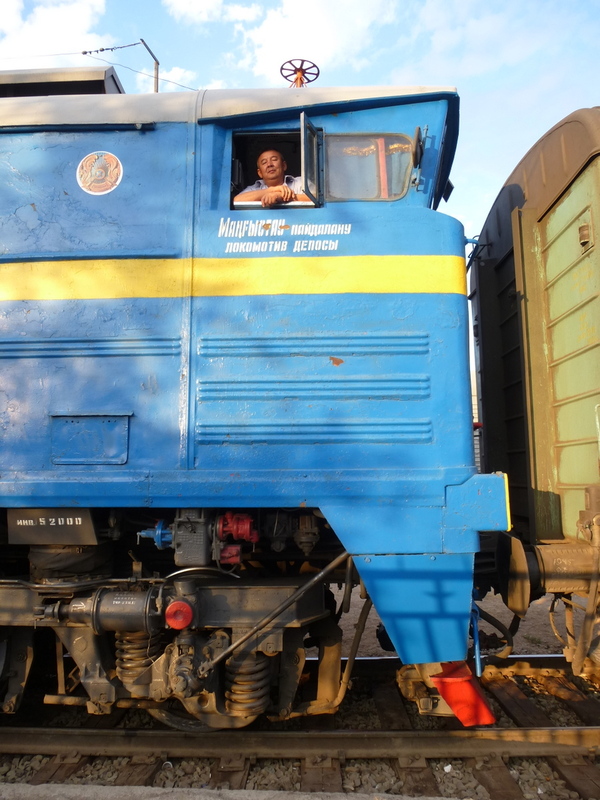 First – we had to find Aktau’s railway station – it was 15km out of town with not a signpost anywhere! Apparently, in the Soviet’s ‘standard town plan’ – the train was for military use only! We arrived at the station two hours early and watched with amazement the throngs of people, all with very large amounts of oversized luggage, getting on and off the trains. When our train arrived we spotted that it had a goods wagon and decided that it was probably the best place for the bikes. We picked our way through the crowds to the front of the train only to be told “No”! With the clock ticking away and now needing to dismantle the bikes so that they could be bundled inside the carriage, we knew we had to be quick. The train would depart regardless of whether we where half on or off! The train was 25 carriages long and our seats were right at the other end so we jumped on the bikes and pedalled along the platform weaving between the crowds. With a good bit of team work and the help of a local, we just had enough time to bundle all the bags aboard, dismantle the bikes, and wedge them between our sleeping benches. We have never slept so close to the bikes before! 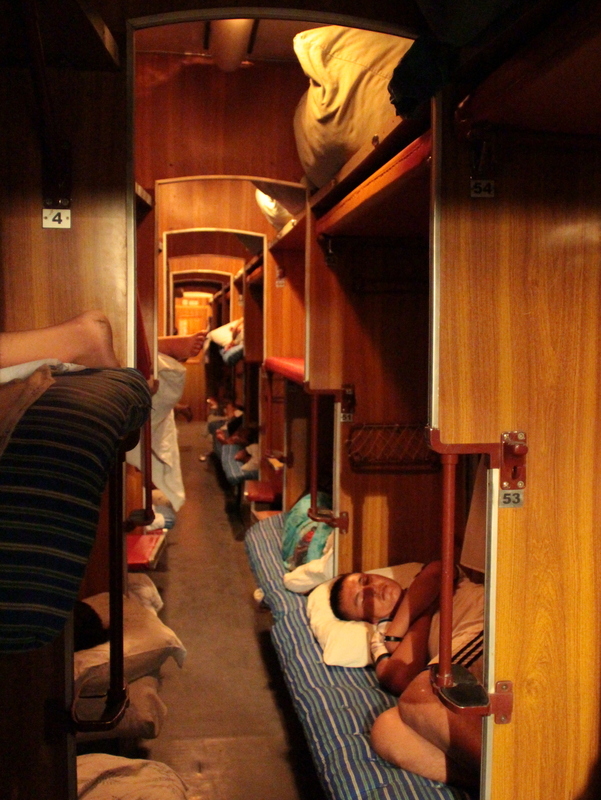 The train was classed as an open sleeper with no cabins, and is just filled with bunk sleeping platforms. There were approximately 100 people per carriage, meaning that the train carried an incredible 2500 people. After a hot nights sleep and watching the desert sunrise through the window, it was time to repeat the process and change trains. Becoming a bit wiser to central Asia train travel, Tim did a very good job of pacing out where our next carriage would stop. We would then be all ready to battle our way onto the train. Once again the train arrived nice and early and with us already in the right place with the bikes dismantled, it was just a case of getting it all on. This was done with comparative ease as the train conductor was quite helpful and stuffed one bike and both wheels into a cupboard at the end of the carriage, the other resting across the shelves above our heads, all without needing any bribes. The desert scenery outside the window was the same for the entire length of the journey, with just the odd camel or two to admire. They really are funny looking creatures! 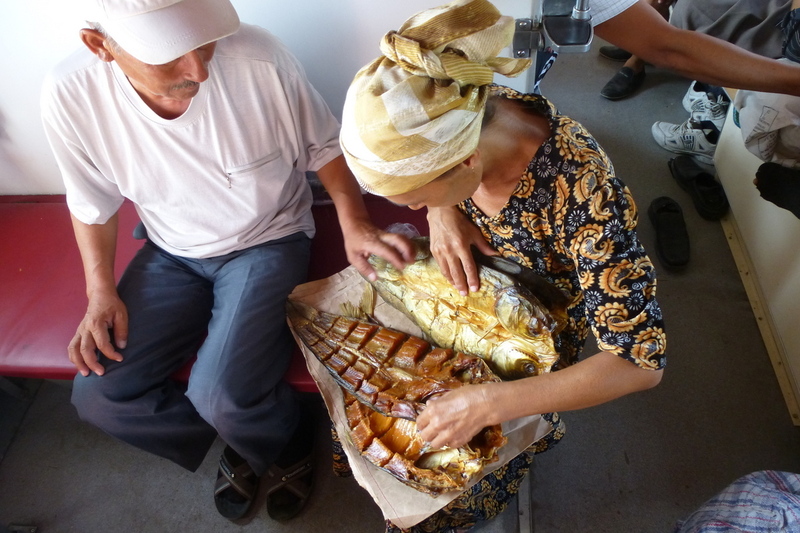 100USD in Uzbek Som, – Fancy a fish?